Many of us spend more time in our cars than our homes. Some of us have long daily commutes. Others use their cars as mobile offices for sales call. Moms shuttle their kids to school and numerous after school activities. 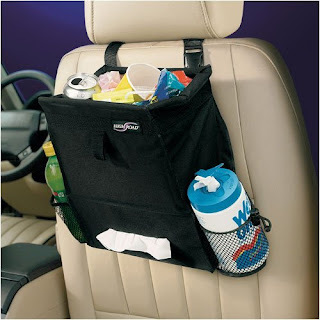 Considering all the time we spend on the road, its no surprise that clutter and trash tends to accumulate in the car, usually on the floor. 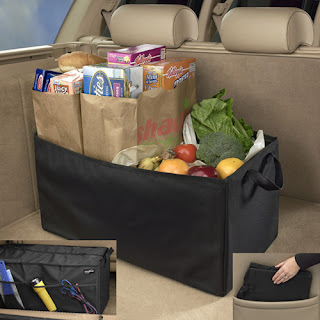 Here are some products and strategies to keep your car tidy. This organizer comes in many variations, but they all do the same thing - provide a convenient place to stash your stuff and keep it off the floor. This is particularly helpful with kids as they tend to have lots of stuff to distract themselves in the car. 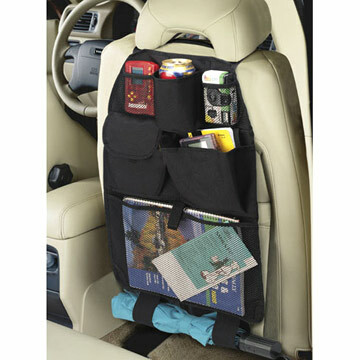 This is another variation of the back seat organizer designed specifically for trash. As a cheap alternative, I slip a plastic grocery bag around my stick shift. When it gets full, I slip it off, toss is in the trash and slip on a new one. This handy office organizer sits on the passenger seat and is perfect for sales people who visit many clients during the day. The hinged top opens up to provide a work space for a laptop. Handy compartments hold files and office gadgets. It's a desk on the go. Some of us use our trunks as external storage lockers, which is perfectly acceptable if you have sales samples or weekly sports activities that require lots of gear. To prevent your items from rolling around and getting damaged, keep them contained with a trunk organizer. Tidy the car when pumping gas: It only takes a couple minutes to fill the car, so take this time to clean the car. Toss out the trash, pick up items from the floor and put them in their proper place. The car is actually a very small space, and you will be surprised to see how much you can accomplish by the time your tank is full. Keep a trash can in the garage: For many families, the garage serves as the main entry and exit point of the house. Keeping a trash can in the garage makes it easy to quickly rid the car of trash. Don't leave the car empty handed: Anytime anyone gets out of the car to go in the house, they need to grab something and either put it away in the house or throw it away.